The better your flowers are presented - the higher price you will get. 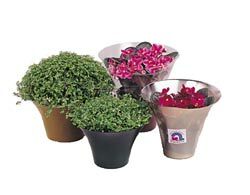 FloraCup is the ideal packaing for plants an d will make them look well worth the price - and more. For just a few cents, the FloraCup design enhances the quality of plants and makes them look their best. In addition FloraCup protects the plants against damage during transport and encourages proper handling until the plant reaches the customer. FloraCup is available in a custom-made design for most types of plants. Upon request, we will develop special designs for your plants. These designs are available in several colors and with bar coding.